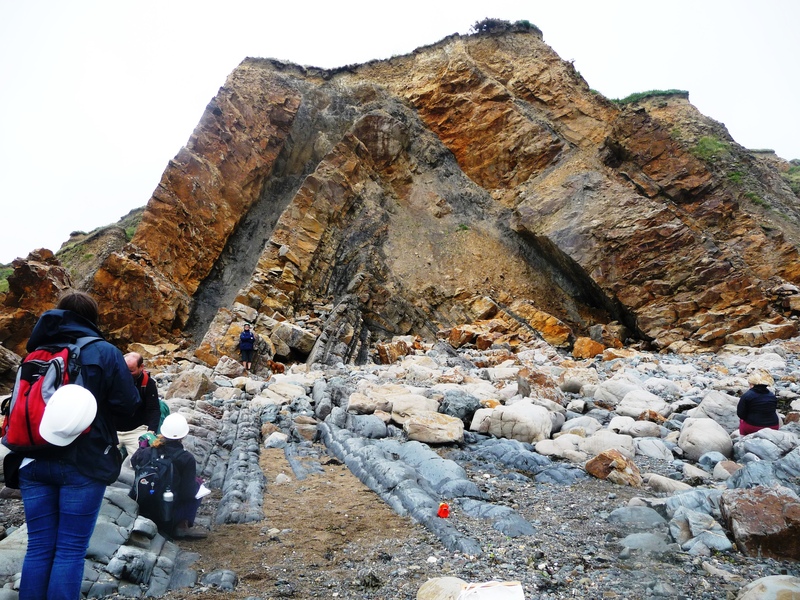 I visited this first as an Open University student in the 1980s: it is a wonderful, and safe, beach for teaching tectonic structures, sedimentary structures and basic field skills with plenty of steeply dipping and folded exposure of the shales and sandstones of the Bude Formation. I’ve been running field days here for the last 20 years or so: the joy of it is that the rocks are well exposed and the exposures are clean, easily accessed, and plentiful: no problem spreading 20 or 30 students out along a section. Then there’s a bonus: not only can they seen the plan view of these beautiful plunging folds on the shore platform, but if they turn around, there they are in section in the cliffs! A second bonus is that a walk along the cliff path gives a great bird’s-eye view of the rocks on the foreshore… all great stuff for helping with that perpetual nightmare, 3D visualisation of structures. Then, when the students have measured the dips, strikes, plunges, azimuths etc until they can do it in their sleep, they can go on to describe the rocks, put together graphic logs, and get masses of practice at field sketching on all scales from the beautiful little, cm-scale, folds and faults in the contorted beds up to folds as high as the cliff. And this is all done from a sandy beach, within 10-minutes’ walk of the car park and cafe. It has to be my favourite UK geosite for teaching of all time. Tags: 100geosites, education, widemouth bay. Bookmark the permalink. Previous post ← A new version of Sopwith’s Buckland portrait? Excellent description. We can all appreciate the beauty of geological sites, but understanding them is another matter and Linda describes an essential part of geoscience education – getting out and seeing and learning about the rocks for yourself as well as learning and practising the skills needed to appreciate them even more!